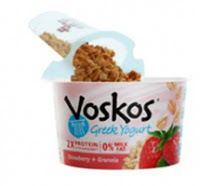 Head over to Voskos on Facebook to get a free one-week supply of Voskos Plus Granola. This promotion ends today, January 25 at 8 p.m. EST (6 p.m. MDT). Watch the 30-second Voskos video. There are 3 captions that apear in the video (which are 3 reasons to enjoy Voskos plus Granola). Email those 3 captions, plus your address to FB@Voskos.com to get 7 free product coupons mailed to you! Thanks, Saving Cents with Sense.